Annually, March 30 is World Bipolar Day. To mark this significant, internationally recognised day, Deakin University’s IMPACT Strategic Research Centre is pleased to present a free community event: 'World Bipolar Day – Questions Unanswered?” on the evening of Monday 1st April 2019. This event aims to share knowledge about bipolar disorder while supporting the broader World Bipolar Day vision of reducing social stigma that often surrounds mental illness. The community forum will include an opening address from Neil Cole, award winning playwright, mental health researcher, and former Victorian politician. 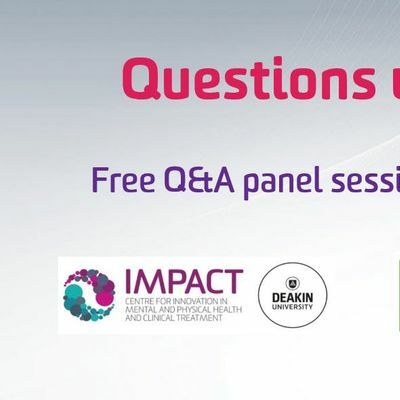 The event will feature three panellists (Prof Michael Berk – world leader in bipolar research, Jason Trethowan – CEO at headspace, and Matthew Dale – an expert by experience) who each will give presentations, before the session will be opened for the public to ask the panellists questions. A series of educational tables will also be set up, offering more information about local services, support, organisations, groups and programs. Prof Berk is currently a NHMRC Senior Principal Research Fellow and is Alfred Deakin Chair of Psychiatry at Deakin University, where he heads the IMPACT Strategic Research Centre. Prof Berk is an expert in bipolar disorder and has authored over 950 publications in his field. He is ranked in the top one percent of the world for research in his field. Jason Trethowan joined headspace as its Chief Executive Officer in 2017. Headspace is the largest national network of enhanced primary health care, youth mental health centres worldwide. Prior to this appointment, Jason held senior leadership positions with the Western Victoria Primary Health Network, Barwon Medicare Local, and the General Practitioner’s Association of Geelong. Jason is also a Board Member of Barwon Health. Matthew Dale has worked in the mental health sector for over sixteen years for several different organisations in various positions, including roles in mental health promotion, peer work, outreach support, respite, family & carer work, and mental health education. His passion and interest is in mental health promotion and early intervention/prevention. He also volunteers as a peer ambassador for SANE Australia and is a committee member of the organisation, Bipolar Life. He was drawn to working in the mental health sector due to his own experience of mental ill-health (Bipolar II) and recovery. Neil Cole is an award winning playwright, researcher, and former Victorian politician. Almost five years into his career as Member of Parliament, Neil was diagnosed with bipolar disorder and was forced to resign as Shadow Attorney-General. Neil left politics in 1999 and has since written more than 30 plays and two books. He is an Associate Professor at the University of Melbourne where he studies creativity and mental illness. Associate Professor Olivia Dean is currently Director of IMPACT TRIALS and a R.D. Wright NHMRC Biomedical Research Fellow at Deakin University. A/Prof. Dean has established a solid track record with over 80 publications and several successful grants totally over $AUD 8 million. A/Prof. Dean is committed to providing better treatment outcomes for people with mental disorders and is actively involved in ensuring her research reaches the community and is translated into clinical practice. The Geelong Library & Heritage Centre is located on Little Malop Street, adjacent to Johnstone Park, in central Geelong. It is easily accessed from the Geelong Railway Station (located on Railway Terrace) and Geelong Central bus interchange (located on Moorabool Street). There is secure parking at the multi-level Civic Centre Car Park, located opposite City Hall on Gheringhap Street. The car park provides a secure environment, a quick and easy payment system, affordable rates, and quick access to the Geelong Library & Heritage Centre. There is also street parking on the streets surrounding the library. Please bring your ticket to the event. In the case that you have forgotten your ticket, a guest list will be available at the door.